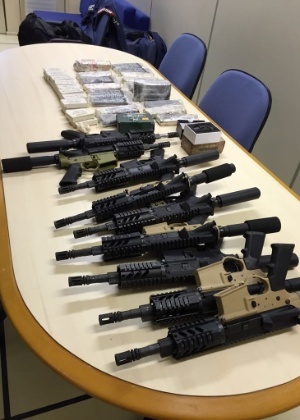 “The Federal Police arrested on Wednesday morning ten people suspected of collaborating with drug trafficking administered by the PCC (First Command of the Capital) criminal faction in the city of Itaquaquecetuba (Greater São Paulo). As of this morning, two other people with an arrest warrant issued were still wanted by the same operation. Among the suspects are a CCP dealer and his brother, as well as a pastor of an evangelical church, a real estate agent and owners of butchers and car dealerships. They would facilitate the drug trade in the county and do money laundering, according to the FP investigation. According to Fabrízio Galli, head of the PF narcotics repression station, the two brothers were the main targets of the investigation because they were responsible for trafficking in the city. “The money from the traffic was tithed at the church that was built just for this function,” he said. “The owners of car companies gave up cars for drug transports. In all, 19 arrest warrants were issued on property in Itaquaquecetuba. The PF did not identify the exact locations or identity of the suspects. “They performed activities that seemed ordinary but had as a main objective, “Galli said, adding that the detainees will be charged with drug trafficking and association with drug trafficking, and some will also be charged with illegal possession of firearms together with a fine of up to 31 years in prison. The investigation began as a result of a seizure of arms and drugs in Ipiranga, south of the capital, on April 26, 2016, by PF men, and two men were arrested on drug charges. 890 kilograms of cocaine, 11 rifles, two pistols, ammunition and three cell-phone blockers were apprehended in Itaquaquecetuba. By the end of that year, information had been collected from the arrested men. In January 2017, the PF began an operation to try to figure out where those drugs and weapons would be taken. After a year and a month, the Justice of Mogi das Cruzes decreed the temporary, 30-day detention of the 12 suspects target of today’s operation. Still according to the PF, the weapons arrived through the border with Bolivia in 2016. Promoters investigating the CCP affirm that Rogério Geremias de Simone, Gegê do Mangue,41, and Fabiano Alves de Souza, Paca, 38, indicated as the numbers 1 and 2 of the free faction and found dead in Ceará last Thursday (15) were responsible at that time for drug and arms trafficking in that area. The PF reported that, despite being a local investigation, it did not count on the support of the Civil Police and MP (Public Prosecutor) because there was no need.